Marvel Studios has a history of taking some big risks, from the men behind the camera to those in front of it, and “Guardians of the Galaxy” is perhaps their biggest one yet. Not only is the comic book on which it’s based an unknown quantity to most moviegoers (if Iron Man used to be considered a B-list character, then the Guardians are on the D-list), but James Gunn isn’t exactly the first person you’d think of to direct a big-budget comic book movie. 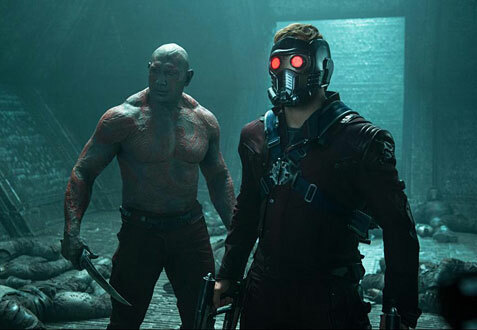 Despite his lack of experience, the bigwigs at Marvel clearly saw something in his earlier work (the horror comedy “Slither” and the superhero satire “Super”) that suggested he was the right man for the job, and Gunn has definitely repaid their faith in him by producing the best possible version of a “Guardians of the Galaxy” film and one of the most purely fun Marvel movies to date. Chris Pratt stars as Peter Quill, a member of an intergalactic group of thieves and smugglers who was kidnapped from Earth as a young boy. When he’s sent by his boss Yondu (Michael Rooker) to steal a mysterious orb, only to double-cross him in order to keep the artifact for himself, Quill becomes the target of a power-hungry alien named Ronan the Accuser (Lee Pace), who’s made a deal with the Mad Titan Thanos (the purple-skinned figure teased at the end of “The Avengers”) to give him the orb in exchange for destroying his enemy’s home planet. 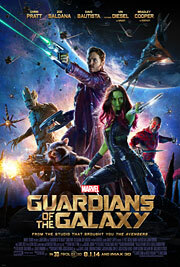 After he’s captured and thrown into prison, Quill teams up with a quartet of fellow misfits – deadly assassin Gamora (Zoe Saldana), revenge-driven bruiser Drax the Destroyer (Dave Bautista), gun-toting raccoon Rocket (Bradley Cooper) and tree-like humanoid Groot (Vin Diesel) – to mount an escape. But when the group discovers the true power of the orb, they agree to stick together a little longer in order to prevent it from falling into the wrong hands. There’s a lot more to the story, especially when you get into each character’s different motivations, but elaborating any further would likely only cause confusion, which is one of the biggest hurdles that the film is going to encounter with audiences. So few people actually know about the Guardians and the universe they inhabit (often referred to as Marvel Cosmic to differentiate between the Earth-bound action of the Avengers) that there’s a much larger learning curve than usual. Of course, that’s also its biggest asset, because it provides more freedom for Gunn to tell the story that he wants without worrying about any repercussions that it might have on connecting films, unlike this year’s “Captain America: The Winter Soldier,” which proved to be a huge game changer for the future of the Marvel cinematic universe. “Guardians of the Galaxy” is the closest thing to a standalone movie that the studio has made since the first “Iron Man,” and Gunn absolutely nails the offbeat tone of the source material, creating a sort of punk rock “Star Wars” that delivers big on adventure and comedy with a thoroughly entertaining cast of characters. Though Lee Pace and Karen Gillan’s antagonists aren’t as memorable as past Marvel villains (blame Loki for setting the bar so high), everyone else is great in their roles. Chris Pratt is perfectly cast as the Han Solo-like ruffian, oozing charisma with plenty to spare, and Dave Bautista is surprisingly good as the no-nonsense Drax, but it’s the rambunctious Rocket (voiced by Bradley Cooper) who steals the show in hilarious fashion. That shouldn’t come as much of a surprise to fans of the comic, but with Rocket and his sidekick Groot, Gunn has created two of the most dynamic CG characters in recent memory. He even found a way to make excellent use of longtime collaborator Michael Rooker, who gets quite a bit to do as the mohawked space pirate Yondu, including one of the film’s best moments. As expected from a movie like “Guardians of the Galaxy,” there’s no shortage of action, and a lot of it is really well done, but some of the most enjoyable scenes are those where the Guardians are just sitting around talking (or more specifically, bickering over a plan), because they complement each other remarkably well. Finding that balance where all five characters are represented equally isn’t an easy feat, but Gunn does a good job of giving each of them the attention they deserve. In fact, it’s hard to find much at fault with the movie beyond the lackluster villains and a few other minor things. It’s not perfect, but if Gunn’s objective was to make a funny, action-packed and slightly off-kilter space opera that introduced audiences to the Guardians and left them wanting more when it ended, well… mission accomplished.